In a blog post today, JetBlue notes that the terrible weather means the main airports they use for operations are basically going to turn into "ice rinks" tonight as a polar vortex sends temperatures plunging to near historic lows. 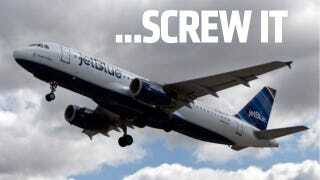 More than 3,000 flights across the industry have been cancelled today, and roughly 300 of those will be JetBlue's. Beginning at 1 p.m. ET today, we'll reduce operations at JFK, LaGuardia, Newark, and Boston through 10 a.m. ET Tuesday. At that time, we'll gradually ramp up again – we intend to be 100% operational by 3 p.m. ET on Tuesday. This plan allows for 17 hours of rest for crews, and time for Tech Ops to service the aircraft. It's also worth pointing out this is consistent with what we were warned about as new rules go into effect this week. Stay warm folks.